Utah has a lot of splash pads, and we've checked out and reviewed some for you! Check out our reviews at Utah's Adventure Family. You can click on our water activities for pools, splash pads, and waterparks. Or you can just click on the link below to get pictures, reviews, and directions to local splash pads. The Alpine Splash Pad is part of a larger park called Creekside Park in Alpine. Creekside has three playgrounds, two sets of bathrooms, tennis courts, basketball courts, a sand volleyball court, two pavilions, and lots of grassy areas. There is a lot of stuff to do! The Provo Splash Pad at Pioneer park is one of our favorites. There is a shower, fountain holes, and lots of water. This one is usually pretty busy, but the layout is really good. The Snowflake Fountain at the Gateway isn't really a splash pad, but there are a lot of kids in swimsuits with towels, and you are allowed to play in the spray. The design is simple. A whole lot of little holes in the shape of a snowflake that shoot water in a choreographed way. Herriman Splash Pads: Herriman has 2 small splash pads for those of you on the south end of the valley. These sites tend to be less busy, even though there is less water. Eagle Mountain Splash Pad features dumping cups, two shower sprayers, and lots of fountain sprays that randomly shoot. I noticed young kids and big kids enjoying this splash pad. 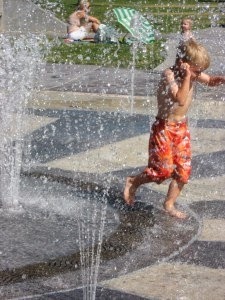 Highland River Splash Pad: This park is great for kids under age ten. Water comes out from the bridge and opens up into a wide ankle-deep stream. In the stream there are rocks for the children to climb on and fountains that they can play in. There is a small traditional splash pad nearby. Children's Discovery Garden: If you've got a Thanksgiving Point pass, you can enjoy a small splash pad that is patterned after Noah's Ark. This one is especially fun because there is a lot to do close by. For our reviews on hikes, museums, camping, and all other adventures in Utah, come on over to Utah's Adventure Family and follow us on Twitter, Instagram, Facebook or Pinterest.